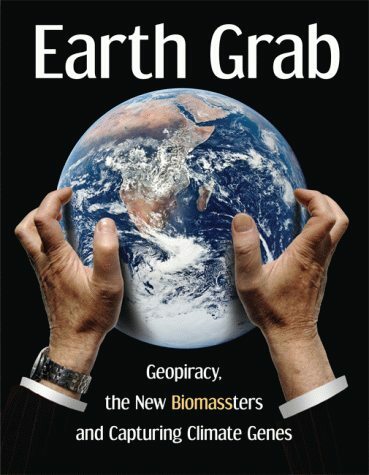 'Earth Grab - Geopiracy, the New Biomassters and Capturing Climate Genes' - essential, cutting-edge climate science in everyday language - published this week (27 October 2011). The authors reveal information that the large corporations who profit from climate change do not want the public to know. 'Earth Grab' analyses how Northern governments and corporations are cynically using concerns about the ecological and climate crisis to propose geoengineering 'quick fixes'. These threaten to wreak havoc on ecosystems, with disastrous impacts on the people of the global South. As calls for a 'greener' economy mount and oil prices escalate, corporations are seeking to switch from oil-based to plant-based energy. The authors expose some truths behind the exploitation of biomass, which is far from the solution to environmental problems that many have claimed it to be. A biomass economy based on using gene technologies to reprogramme living organisms to behave as microbial factories will facilitate the liquidation of ecosystems. This constitutes a devastating assault of the peoples and cultures of the South, accelerating the wave of land grabs that are becoming common in Africa, Asia and Latin America. The book shows how the worlds largest agribusiness companies are pouring billions of dollars into, and claiming patents on, what are claimed to be 'climate-ready crops'. Far from helping farmers adjust to a warming world – something peasant farmers already know how to manage – these crops will allow industrial agriculture to expand plantation monocultures into lands currently cultivated by poor peasant farmers. They are not a solution to growing hunger, they will feed only the corporate shareholders' profits. Eminent environmentalist Vandana Shiva, founder of the Research Foundation for Science, Technology and Ecology, writes in her foreword that this research 'pulls back the curtain on disturbing technological and corporate trends that are already reshaping our world and that will become crucial battlegrounds for civil society in the years ahead'. The book has already captured the attention of writer Naomi Klein, who writes that this 'crucial book reveals ... Indispensable research for those with their eyes wide open'. Campaigner George Monbiot adds that its exploration of 'three crucial issues which will come to dominate environmental and human rights debates in the coming years make it an essential resource for anyone trying to keep up with the times'.